What makes the Pebble so special? The smartwatch syncs with your iPhone or Android smartphone for a uniquely useful device. With seven days of battery life and an e-paper display, the watch face is readable even in bright daylight. It connects to your smartphone with Bluetooth 4.0 support, providing email and SMS message alerts as well as a range of uses through specialized apps. For example, runners and cyclists can use Pebble to provide instant distance, pace, and speed information by accessing their smartphone's GPS data. It can also control music on smartphones, with access to iTunes music libraries as well as apps like Spotify and Pandora. The Pebble team will make the watch's SDK available, enabling developers to continue creating new watch apps, which can be downloaded through your smartphone. Of course, now that you want a Pebble, the bad news is that you can't have it. Not for a while anyway. To fund its first production run, the Pebble team turned to crowd-funding site Kickstarter, where people can donate to worthy projects with rewards offered at tiered donation levels. With eight days left on the Pebble's Kickstarter it already sold out of all donation tiers, with 85,420 watches going to backers in its first run. The only donation tier remaining is the $1 level, which allows you to "keep up-to-date on all things Pebble with exclusive updates" including information on when Pebble watches may next be available. The Pebble Kickstarter campaign raised more than $10 million, far above its initial $100,000 goal. 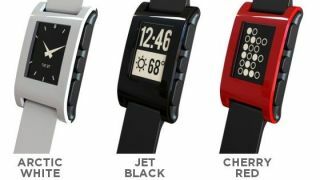 Pebble watches will be priced at $150 after the initial production run for Kickstarter backers, though the Pebble Team hasn't announced when that may be.